Home palette Bright Eyes - 120 Pro Palette Second Edition Tut & Giveaway! Bright Eyes - 120 Pro Palette Second Edition Tut & Giveaway! I recently tried out the newest eyeshadow palette from www.SedonaLace.com. They are now offering the 120 Pro Palette Second Edition. The palette is the same quality as the first but offers a different mix of colors. To see my review and tutorial, click here! First off, I still received my product in the mail super quick and amazingly bubble wrapped and protected. This time around, I took pictures to see you how well it's packaged. All products are amazingly shipped priority mail within 1 business day of their order. They also have began printing the Sedona Lace logo on the outside of their palettes. I also had one slight crack in an eyeshadow...luckily it's a color that wasn't my favorite, so I wasn't that disappointed. The colors range from super vibrant to neutral. This palette differs from the 1st edition because it has more pastels, more bronzes, and less of the mixed shades that the original palette had. I actually find this palette a little bit more wearable than the first. You get a lot of great colors. They apply the exact same. Shades range from matte, to satin, to shimmer. I find that the shimmery ones apply super easily and pigmented while some matte ones may take a little time to work with. Remember with these shadows to wear a creamy eyeshadow base. Pat the shadow onto your eye for color and don't overblend. That's the key to mastering these looks. Just looking at the shadows inspired me to do a super fun, bright look. Don't forget to use coupon code: renren for $4.00 off your order! FTC Disclosure: Product received for review. I am not affiliated with this company and not paid to write this review. These are my honest thoughts and opinions. I would like to win this palette because I don't have any outstanding palettes other than coastal scents 88 palette. I'd love to be able to work with more variety of colors and be able to play around with all of the different colors. I would LOVE to win this giveaway because this product looks AMAZING and I would love to have such beautiful and awesomely pigmented palette of colors so that I could try and duplicate this great look! I would LOVE to win this palette because the colors are beautiful and I can think of so many things I would do with them. I would like to win this because i would like to try out their palette. It look like it have lots of color that you can play around with. The Sedona Lace Palette has wonderful colors that are perfect for me since I love bright and beautiful colors. I have never tried eye shadows from there collection so I would be very happy to win this and create beautiful looks! would love to win the palette to experiment with bold colors! 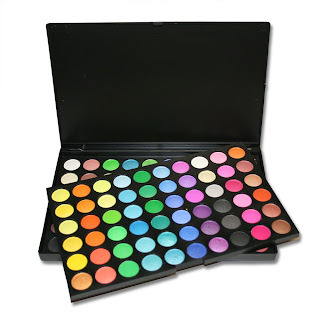 i would like to win this pallete because i have no professional quality eyeshadows except for 3 and they are not very pigmented at all :( i would lov to be able to play with color and etc. I would love to win this palette. I don't have a good, vivid palette that isn't overly shimmery. This one looks great! Hi Ren! I'd love to win this palette because I don't own any palettes & it looks like it's so easy to work with. Also the colors are gorgeous! I'm a big fan of pastels especially. I follow you on YT &Twitter under my username bobbysgeel. Thx for this giveaway & good luck to everyone! I would like to win because this palette has a wide range of lovely colors I can use! I would loooooove to win !!! Thank you pretty !!! =) Kisses from Mexico ! I would love to WIN because this palette looks amazing and I have not tried any of these products before. I want to win this because I'm currently a cosmetology student and makeup applications are one of the progresses we have to have. We're not supplied a makeup kit until 1000 hours (Indiana's program is 1500 hours) but we have to get 30 application before we can graduate. We have to supply our own makeup at first and it would be so great to have all of those eye shadows in one place instead of digging around through singles! i would love to win this palette because i see so many You Tubers using these multi-colored eyeshadow palettes and am unable to purchase one for myself. I would also love to recreate the same look you did on myself as well cause it looks so awesome on you. You did a great job and i love watching you. Thanks so much Ren:)!! following sedona lace on twitter! I would love to own this palette as currently I am not working, and really can't afford to purchase many of these dynamic colours. I am also being encouraged to do some video responses but I am too shy to do it with my limited supply of shadows. I would also like to say thank you for the great tutorial. Appreciate it! i would LOVE to win this palette because it has a lot of variety colors, the pigment on the colors is pretty good (especially for the price they sell it for), and they last a pretty long time even though they're a dime size. its just amazinggg!!! so many words to say about this palette!! =) thanks for the giveaway!! I would love to have this palette because these (the ones you used in the video) are all the colors I really like and use every day. To have them all in one palette would be wonderful. I love your blending! I don't own any large palettes so this would be ideal for me. Thanks for what you do RenRen! I would like to win this palette because this product looks great and will last me a long time. I think this palette looks really pigmented and has a beautiful mass of colors that will be great for people like me who like to try new looks. Hi, I loved your tutorial using the Sadona Lace pallete. It was gorgeous. I'd like to win this pallete because I am just recently starting to get into make up & soon I will be going to school to get my liscense as a MUA. This product will help me practice a lot better & do a lot more fun looks. Currently I only have the 88 shimmer pallete from Coastle Scents but the more variety the better. Thank you so much! Even if I don't win, I plan to continue watching you're videos & reading your blog! I would love to win this palette because I'd enjoy experimenting with such awesome hues and try to get a similar look to yours! hey ren! i would to win this giveaway bcuz i dont own any of the makeup palettes & i love the fact that i could have a range of colors to use to create a wide range of beautiful makeup looks! plus i love the makeup look you recently did with the palette & ofcourse it would be excellent for travel bcuz it would cut down having to bring a million in one makeup products lol so over all this palette is great & i would really love to have it! I'd like to win because I'm 50 years and I never have been able to acquire any good quality makeups ,I have only 3 single eyeshadows. This would be my chance. I cross my fingers.Thanks the opportunity to participated. You and your collaborators have been very generous. I would love to win the palette b/c I just saw your video & WOW I want to learn how to do the look. The colors are amazing & I want to look as gorgeous as you ;) Good luck to everyone! So I would absolutely LOVE to win this palette because i am an aspiring makeup artist with no good quality makeup yet(sad i know). But I would be ecstatic to win this palette as the first addition to my makeup journey. Thanks a bunch!!!! I would love to win this pro palette because I am trying to branch out of neutral eye looks into some fun colors this summer. Blue is my favorite color but I can't figure out how I can wear blue on it's own. 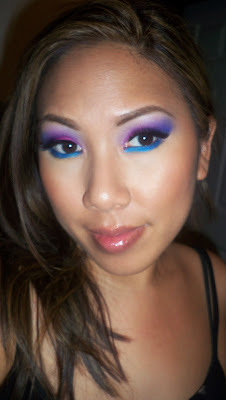 This palette is great for mixing colors together to create a nice wearable eye look. Also, This palette would be perfect for me because I am Indian and I wear a lot of colorful outfits at weddings, holidays etc. Thanks for hosting this giveaway! I would love to win so that I can do a review of this product on my blog!! I follow you on Youtube (I'm nikita2471) and I have your blog on my Google Reader. I would love to win this palette because I don't have any of the big palettes! i would like to win this palette to use for bright summer fun looks. it has all the colors of the rainbow and would be really useful. I would L O V E to win this palette for so many reasons. i have viewed your videos for two years and i LOVE all the old school renren looks and this palette. it looks like something i could use to re create those looks. i dont own any palettes at all but it doesnt stop me from looking good. but it dont mean i dont deserve to win. I would love to win the 120 eyeshadow palette 2nd edition from Sedona Lace. I love everything that has to do with color. 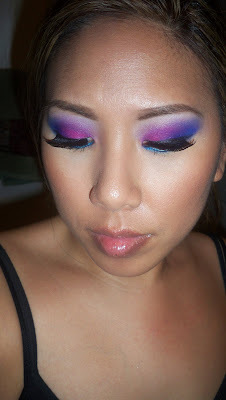 I would love to create many different looks, also to try the bright eye look that you did on your tutorial. i would love to win the palette because i always like to experiment with other funky colors and create many different looks from neutrals to fun colors. I would like to win because I love eyeshadows and I don't have a 120 palette with all these bright colors. I love trying new products. I would loove to win this palette because 120 eyeshadow colors is a dream to work/play with! I love makeup and this would be a perfect addition to my skimp makeup collection. I would love to win because my sister's wedding is coming up and she wants to have a dramatic look with nice colorful, bold colors. And she wants me to do her make up that day so I would like to use a nice pigmented palette and make her shinneeee! & I'm following your blog. I would LOVE to win because I've never owned a palette like this. I love bright colors & this palette is perfect! I'd love to win this palette because I don't have a lot of makeup in general, but I love playing around with the few colors I own and creating new looks from random inspiration, videos and ideas. Actually, what I'd do with this palette, or any palette, if I ever save up for one, is make as many looks as possible (using just the colors in the palette), document them (pictures!) and post them in a blog. Kind of like an FOTD or OOTD blog, but just a look-of-the-day with this palette. I think it'd be interesting to see how many looks I could get done, and maybe how many days I could go using just the colors in this palette. In my free time I like to just practice my makeup skills at home and see how natural or crazy I can get with looks, so this palette would be fun to have. And, thanks for the awesome tutorial and for hosting this awesome giveaway! I would like to win this palette because I can't afford to buy many different eyeshadows, but would really like to experiment with different colors. I want to win this because I want the chance to experiment with different looks on myself and on others. i have subscribed ur youtube channel as Sad20ful. i m fan of sedona lace on facebook as Sarah hussain. I m friend of Sedona lace on facebbook as Sarah hussain. I'd love to win this palette, the colors seem AMAZING! I would appreciate winning this palette as I am an aspiring makeup artist that's been out of work going on 5 months now and I have no money to spend on increasing my kit! Gorgeous colors. Sedona lace is killin it! I been following beauty bloggers for a while and have seen the coastal scents palette come and go now we got sedona lace.... I need to try something! I just got myvery first MAC haul this would be even better! I'd love to win this palette because I can't find more than plums and browns eyeshadows in my country, and I love bright colors! 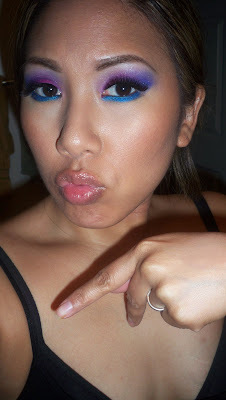 love the bold makeup look renren! i would love to win because i think the vivid colors are amazing!! The eye shadows look amazing! I'm a newbie when it comes to bold MU looks and I think this would be a great way for me to experiment with color! Hi Ren! I'd love to win this palette because the colors are awesome and I don't have a palette like this yet. Thanks for the giveaway! i would love to win this pallette because i acually never owned a pallette before so it would be nice to finally own a eyeshoadow pallette, and i really good one, as my first pallette. plus the colors on this pallette looks AMAZING!!! I would love to win this palette because I'm a beginner in make-up and I don't have many eyeshadows and this would be great to start off with. Plus I've been hearing such great stuff about Sedona Lace! I would like to win coz I love love love eyemake up! i would like to win this pallete so i can use it on the girls who ask me to do their makeup. I would like to win because I dont own many eyeshadows and would like to try out different looks. Plus since, I am going abroad soon, I think this pallete will be perfect for me! It will save me so much money and space! Anyways, thanks for this awesome giveaway. I would like to win this palette because I have never own a palette before so it would be great if I actually have one and I would love to play with the colors. THANKS YOU! I'd like to win because i've always wanted one of the 120 palettes and now that they have more than 1 edition, i really wanna try at least one of them out :D thanks for the giveaway ren! I would like to win this palette because I love everything and anything about makeup. I don't have any of the 88 or 120 palettes from any brand and I would love to win this one. I can recreate the looks that you have done as well as come up with my own looks. i would love to win this palette because i am still somewhat new to doin' my makeup & i dont even have a big popular palette yet :( it'd be great to get one like this or a coastal scents 88. i just wanna be able to have funn, do my make up & try out new looks ! I would like and hope to WIN this 120 Pro Paletter Second Edition because I have a products emergency. I only have and use like right now for 2 years only Avon products and I never got the oportunity to win something like this products that are very recommend. So I hope to win this palette I am very exited about it!! I would love to win this product because it just looks amazing. Currently the only colorful palette I own is from ELF and it's not that best. I think this would definitely help me learn more about eye looks! I would LOVE to win this palette because right now i'm so into eyeshadows, and i wanna try so many different looks, following your tutorials and i also want to win because i think that when i'm wearing makeup i can express myself in so many ways, i feel pretty when i use makeup, and because the palette is just AMAZING! OMG!!!! The colors are amazing...I would love to win this palette and finally start my palette collection. i like to win this palette because im a high school senior and i do makeup for girls at my school for homecoming, birthday parties, prom, and special events. and wining this giveaway would help me out a lot on a more variety of colors for different looks. I would love to win this palette because it would be a great opportunity to experiment and try out new looks! All I've ever done are neutrals-brown, black, etc. Sometimes when I go out, I'd like to have a much more fun dramatic look which this palette would help me achieve! I want to win this palette because I am an aspiring makeup artist that needs all the supplies she can get to help jump start my passion for the art of makeup. i'mma subbie on your channel and follow you here. I'd like to win this bc i do not have either the 88 nor the 120 palette. it's full of fun colors!!! This is looks like an amazing product. It would be a fun to win this palette. i've done eyes using a few mac colors & this palette would give me the chance to really experiment. I'd like to win this palette because I'm starting to get into makeup and this product would be an amazing piece to my start-up collection. The bright colors in this palette will be a plus to me for being a beginner. I would to win this beautiful palette because I don't own any palettes. I really can't afford one, and this would be amazing! I'd love to win this palette. I own a few eye shadow duos, but not a single palette like this, and I'd love to do more bright, fun looks! You are awesome for holding this giveaway. Thanks very much! I would love to win this palette for the fact that the colors are BEAUTIFUL! (: I also wish I win the giveaway because I'm recently starting to do makeup for this charity in Arizona that Helps Kids in foster care to become little princesses :) &nd I play dress up with them and do their makeup for them! I want to win this because if I have this palette then I won't need any others. It pretty much has every color I can even imagine. And if the color I want isn't in it then I can mix colors. I would love to win this palette bcos it has super gorgeous colours and I don't have those types of beautiful colours. LOVE IT ! I would love to win this palette because it would be a great addition to my all neutral make up stash. I don't buy brightly colored eyeshadow and this would be a great product to branch out and try colorful looks. I would love to win this palette. I have been looking for something with really beautiful colors like this so this would be a great addition to my makeup looks. Thanks for the opportunity. I would love to win because I am new to make up and I love watching your videos for techniques but I am currently only working with limited colors and I would love to be able to make a colorful crazy look like yours with this pallate! I would love to win this palette because i am a beginner at makeup and this would be the perfect opportunity to start building my collection. Thank you for this opportunity. I would like to win this palette to give to my daughter, who is quickly developing a interest in makeup artistry. She would love to have such a range of color to play with. Another great tutorial, thanks! I would like to win because the colors look fantastic and I especially like the pastels. I'd love to win because I don't have many e/s or palettes and I think this would be a great way to get out of my eyeshadow rut and inexpensively have a variety of colors. I'm starting to do friends' makeup and this would give me quite a few options. Also I'm DYING to recreate alot of your looks, especially the purple ones (like the feautred look on this post) and it'd be awesome to have the palette for this. Thanks Ren, you're a doll! Make-Up Artist & I'd Love To Recreate Some Of Yours Looks With It. I would like to win b/c I don't have that many e/s colors and this would complete it! Oh this palette looks great! I've never used Sedona Lace so I would love to win this! I follow both your blog and you-tube..thanks! Hi there! First of all, I love your videos. You're very down to earth and make everything seem so simple! Secondly, I'd love to win the 120 pallate because, at 24, I am JUST getting into makeup. I am basically starting from scratch with not even much knowledge on makeup. Youtube has taught me everything I know! I don't know why it took me this long, but unfortunately I am also a poor graduate student trying to get my PhD in molecular biology. That means no makeup purchasing for me! Thanks for listening and keep making wonderful videos! what an awesome palette! I love your tutorials and reading your posts (esp at work...shhh ^_^) I would love to win this palette; the colors are some that I have never experimented with. HEYYY! i would love to have this new 120 palette! ive been wanting to get a palette like that buh i dont know how to get it and where cuz my mom wont allow me to get somethin from the internet! and i really really like this loook so i would love to win this giveaway so i can do this look and many more! Hey Ren!!! I love this palette because of all it's colors, and just all the possibilities it brings! I would absolutly love to win it!!! Thanks Ren!!! hi renren I WOULD LOVE TO WIN THIS EYE SHADOWS BECAUSE MY WIFE DOESN'T HAVE ANY MAKE UP AS FAR AS THAT AND BRUSHES BUT I KNOW THAT SHE WILL BE VERY HAPPY IF I COULD SURPRISE HER WITH IT!!! I'd like his palette because I always stick to neutral shades and I'm afraid of using colorful shades on my brown eyes and dark olive skin, but after seeing your tutorial I totally wanna do the same look with purple and blue or brown. And I DONOT have any palette with color!! I'm just going to be honest about why I want this palette. I absolutely love makeup and just looking at that palette makes me want it soooo bad! It's my obsession! lol I can already imagine all of the looks I could do with all of those colors. It would be MORE than awesome if I won this palette! I have only shades of brown! This palette is beautifully bright, and thnanks for the chance to win! I would love to win because the only makeup I get are leftovers from my cousin. It would be nice to have my very own good quality eyeshadow palette. I've been wanting it for a long time now but I dont have a credit card to buy it online. Thanks so much for this giveaway ! Color please!!! I'm in need of more color in my makeup bag. This palette would be perfect. Pick me, pick me!!! I would love to win this contest because i am a beginner and i would really like some quality makeup to start with! I would love to win this pallete so so so so much because i simply cannot afford all these eyeshadows seperate and I would love it so much if I won because I wouldn't have to buy it. Money is tight and this would make a huge difference. Plus I do not have 1 palette and 120 colors would be awesome!!! I would love all the colors and this would be a HUGE blessing!! Thank You! I would love to win this palette because I think its a great way to try new & different things without having to buy so many colors at once,and its very easy to have all of them in one easy package! The 120 palette would be a great addition to my growing makeup collection. I'd love to win it as I'm aspiring to build my kit and start doing some free lance work as a side hustle while working my doctorate. Love all your vids and your blog. Super informative. I've learned so much. Keep up the great work. Hey Ren! I would love to win this palette because I really haven't done a lot with eyeshadows and I would love to do your tutorials with it!!! Thanks ren! I would really love to win this palette because I have been following your blogs, tweets and tutorials forever! I always refer to you product reviews before adding to my kit. There are 2 youtubers I follow regularly you and EnKore. Much respect to you as an MUA. It looks like a great product and I love what you did with it. I would be honored to win this palette! I follow you as msriaaa on yt.I'd like to win because I could create every look I can come up with and every look my friends come up with and be sure that the colors will last!